The Vapor Shark store in Miami. Given the vast amount of interest in the effects of tobacco use (there are academic journals devoted to the subject), it’s not surprising that the research community is turning its attention to e-cigarettes, the increasingly popular battery-powered twigs that vaporize a nicotine-filled fluid. But so far, that research has been hard to grasp. Perhaps because the picture has been so muddled, a study released in JAMA Pediatrics last month got a lot of attention because it appeared to offer a clear public health message (though whether it was the correct one is disputed). Analyzing survey data from U.S. middle- and high-schoolers, the authors — scientists at the Center for Tobacco Control, Research and Education at the University of California, San Francisco — concluded that e-cigarette use did not discourage, and might have encouraged, conventional cigarette use. The study’s authors are careful to say that e-cigarette use “was associated with,” but what exactly does “associated with” signify? It basically means that when one increased, so did the other (correlation), but not necessarily that one increased because of the other (causation). Other researchers, including those with ties to anti-smoking groups, quickly pointed out that cigarette smokers are more likely to try e-cigarettes in the first place. The study has another limitation: It wasn’t longitudinal. 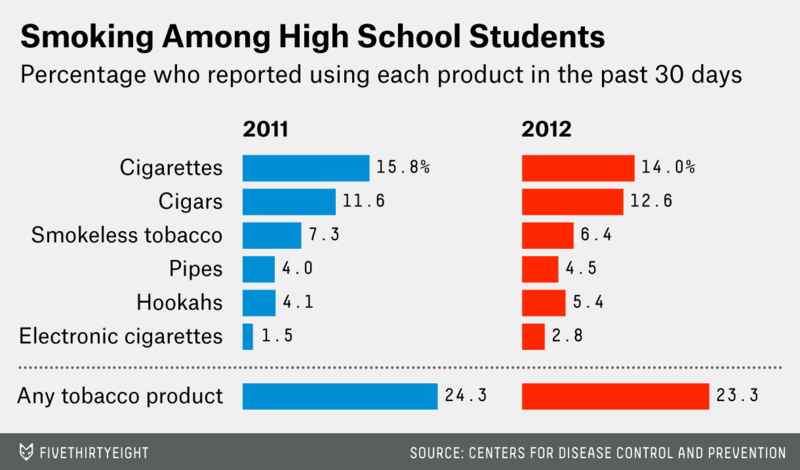 The researchers weren’t looking at the same students in both years (17,353 of them in 2011 and 22,529 in 2012). Longitudinal studies are often crucial in understanding causality. To demonstrate why, here’s an example. Imagine a researcher goes to an office of 1,000 people and asks 20 of them what they drink. She finds that most drink tea. A year later, she goes back and asks another 20 people and finds that most drink coffee. Would you conclude that tea drinking causes people to drink coffee? A report from Citigroup (PDF) projects the e-cigarette market in the U.S. will grow from $2.7 billion this year to $3.2 billion in 2015. Companies are scrambling for a piece of that growth. For example, British American Tobacco — one of the world’s biggest tobacco multinationals — has a subsidiary called Nicoventures (if cigarette advertisements still used cartoon characters, they would definitely come from the land of Nicoventures) that is working to use the technology found in asthma inhalers to deliver nicotine. The ballooning of the e-cigarette market makes it all the more important that thorough research is published on the devices’ health effects. Each study — including the one in JAMA Pediatrics — will move us closer to a clearer picture but it’s unlikely that any single study will get us all the way there.